CNK Closets heads to the Windy City to meet @styleisaweapon and her incredible collection. There are fashion lovers, and then there are fashion lovers, and @styleisaweapon is definitely the latter. We already knew that the Chicago–based collector has incredible personal style—just take a quick glance at her Instagram, wherein she drops everything from Jumpsuits, Gucci waist pouches, and work-ready attire all paired with her beloved AJ 1. But, it wasn’t until she welcomed us into her space that we actually understood the scale of her passion for clothing, sneakers, and accessories. For anyone who occasionally stares into the depths of their closet without a scrap of inspiration, let Style (that's what we're referring to her by, BTW) be your new fashion spirit guide. That whole "don't match" thing is virtually thrown out the window as Style's knack for pairing the perfect High Court Purple AJ 1 with a blazer that seems straight from the same color swatch, gives us a pretty big dose of fashion inspo. All it takes is a herculean amount of personal style. Style is, essentially, one of the most known and unknown sneakerheads in the sneaker community. While her 25K+ following gravitates towards her colorful collection and perfectly paired fits, nobody (aside from her close friends and family) could spot her on the street. And that, to be honest, is the way she likes it. She's not big on names or showing her face but, she loves the shoes, the community, and the style that brings it all back to her user name of choice - style is indeed a weapon. 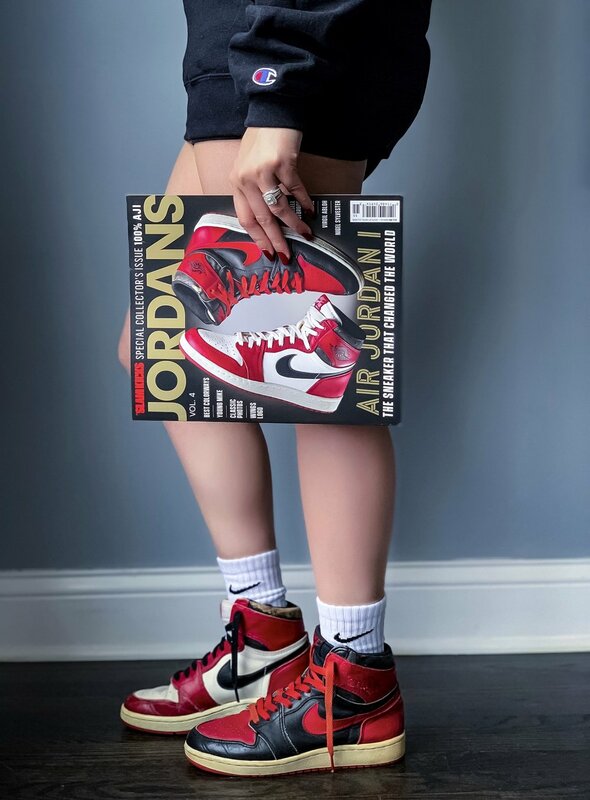 Click through to discover more about why the AJ1 is her favorite ever, her take on the perfect closet (hint: color codes are King) —and how she developed her signature style. Fit and silhouette are always very important to me. When the shoe fits it’s very likely I’ll be buying it in every color. I know that’s kind of boring for some but, I find it simple and more practical to stick to what works as it allows me to make dressing less complicated. I’m a working mom and really don’t have a lot of time to spare thinking what to wear. My style goes from sporty to preppy so sneakers fit into my daily life. Somebody jokingly said, ‘I didn’t find the AJ1 life. it found me.’ That’s somewhat true. I think it was like a match made in heaven, like finding your one true love after so many others. LOL. “I think a “perfect” sneaker closet is really subjective to the person but, I would say any sneaker closet that represents the collector and the story behind the collector is perfect. On the technical side, for a big collection, it would always be nice to have a sneaker room where you can organize, display, and easily find your sneaks. It’s a challenge for big collectors like me, especially because I like to keep my boxes. “When I buy stuff, I usually stick to clean, basic, classic, and practical. I think I represent the majority of hardworking moms and women who want to dress with less fussing. Stylish and not dated but, still easy to put together. I can’t imagine myself a working mom, or a career woman for that matter, spending a lot of time putting together a complicated fit. It would just be an added stress to so many things we juggle. I started collecting in March 2017. March 2019 will be my second full year. Some say in such a short span I’ve accumulated and built a good collection with a variety of years, colorways, collabs, GS options, and ladies drops. I now have at least 100 AJ 1 Highs and and few AJ 1 Lows.